Career Day at Mount Mercy Academy. 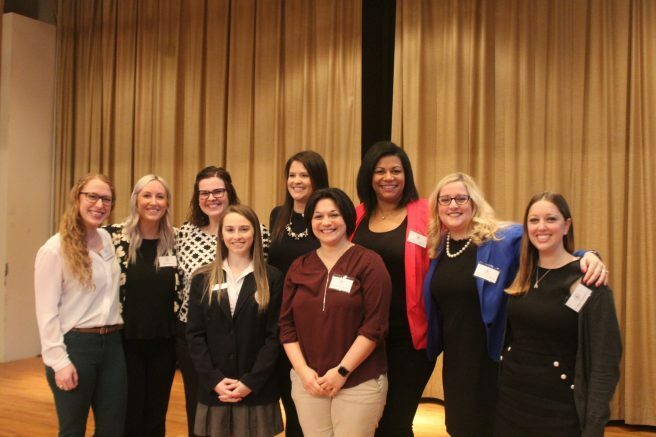 The panelists included Peggy Klavoon Cannan ’06, Claire Kelley ’07, Mary Reidy ’07, Peggy Shea Sherber ’04, Susan Dzierzewski Steblein ’01, Jessica Turner ’02, Susan Anderson Was ’99 and Dr. Megan Wierchowski ’06. The alumnae provided a brief synopsis of their educational backgrounds and their career paths and then answered questions for junior Olivia Larson (Orchard Park), the student moderator for the discussion. Cannan, a physical therapist for Kaleida Health, spoke of how her athletic background led her to athletic training and then her interests expanded to include a spectrum of possibilities when she added physical therapy. She told the students to make the best of their opportunities at Mount Mercy to learn to express themselves and to gain confidence in an all-female environment. Kelley, an assistant controller at Lawley Insurance, told the students that it was important to realize that their education will never stop, even after attaining a college degree. Kelley was inspired to follow her mother’s career path. Riedy, a clinical staff pharmacist at Oishei Children’s Hospital, knew from an early age she wanted a career in the medical field, but did not have in interest in hands on care. She followed her interests into attaining board certification in Pediatric Pharmacotherapy. She informed students that her position is a career, not a job, as she takes the experiences of work home with her, particularly the emotional aspects. Steblein, a certified public accountant with Freed Maxick CPAs, PC and a senior tax manager, chose accounting after she was unable to find a job in her college major. She went back to school for accounting because of the plethora of jobs available and she has never regretted that decision. She encouraged students to take advantage of volunteer opportunities and shadow someone in the fields they are interested in. Turner, a manager in business development at New Era Cap World Headquarters, found her career path through her interest in athletics. A standout basketball player in both high school and college, Turner told the students to find something that they are passionate about and to pursue it. She advised the audience that it is perfectly acceptable not to know what they want to do right away. She also commented, “Be sure to know your worth and to go into all your experiences with confidence. You don’t belong in a box and you should never be satisfied just to be the only woman in a room.” Turner also counseled the students to turn negative experiences and struggles to push harder to achieve success. Wierchowski, a family practice physician at Primary Care of Western New York, chose medicine after helping her uncle through his cancer struggles while she was in high school. She stressed the importance of working hard in college to achieve career goals. She also advised students to take advantage of volunteer and shadowing opportunities. Junior Natalie Redmond of Buffalo appreciated the opportunity to listen to the panel. “It was very enlightening and it definitely helped me as I prepare for my future,” Redmond commented. Be the first to comment on "Mount Mercy Academy holds Career Day"